Enjoy a full day tour including a visit to Topkapi Palace Museum. Visit the Hippodrome, once the centre of life where chariot racing & other public events took place. Tour the Blue Mosque built 1606-1616, famous for it's blue ceramic tiles. 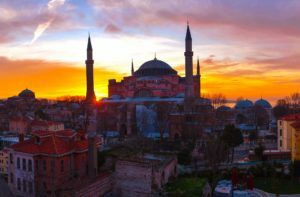 Next see St. Sophia, a church built in the 16th century Byzantine capital, converted to a mosque by the Ottomans, and now a museum, and one of the world's largest architectural wonders. Your last stop will be the famous Grand Bazaar, the world's largest and oldest covered market with over 60 streets. Join an optional dinner with belly dancing entertainment. Visit Troy with its famous wooden horse, best known for being the setting of the Trojan War and many cities built on top of each other. Before arriving into Asclepion, enjoy lunch with locals in a traditional local village. 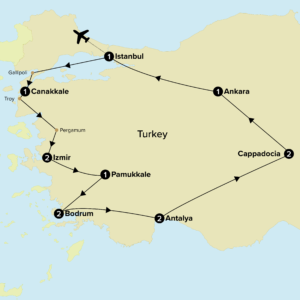 Then continue to Pergamum to visit the ancient Medical Centre in Asclepion and continue to Izmir for overnight. Optional dinner at a local restaurant. Tour the famous ruins of Ephesus, an important cultural center of the ancient world, and explore 2,000 year-old marble streets, a theater, the Library of Celsius, a gymnasium and Hadrian’s Temple. Take a short drive to see St. Mary’s stone cottage where it is believed Virgin Mary spent her last years accompanied by St. John. Continue to a regional rug production centre to have a firsthand experience of this unique art form. Return to Izmir. After breakfast drive to Bodrum and start an explorative tour of wonderful Bodrum city on foot. Dinner & overnight in Bodrum. Enjoy a day at leisure in Bodrum or join an optional day trip to Kos island. Overnight Bodrum. After breakfast depart for Antalya. Dinner & overnight in Antalya. This morning visit Perge and Aspendos, famous for its Temple of Artemis with the afternoon free. Dinner at the hotel. Early morning departure for Konya to visit the mausoleum of the Sulfi philosopher Meviana. Afterwards continue to Cappadocia, on the way visit 13th century Caravanseray and later visit the undergroind city of Sarati. Dinner and overnight in Cappadocia. Dinner at a special local restaurant. Join an optional Whirling Dervishes performance. Early morning departure to the capital city of Ankara through the salt lake area. Enjoy an afternoon tour of the Museum of Anatolian Civilizations, a historic caravanserai, holding artefacts from up to 7,500 years old, including the most extensive and valuable collection of Hittite artefacts in the world. Dinner at a special local restaurant and overnight in Ankara. After breakfast, check out of the hotel and trasnfer to the airport for your departure.